The little actions we take each day can make big change. To celebrate Earth Week, we partnered with Ignition, Inc. to show how turning off your lights while you watch TV can save massive amounts of energy. Go green and get your Game of Thrones fix at the same time—it’s that simple. Northwestern University in Qatar and the Doha Film institute conducted a survey to find out how those living in the Middle East feel about and perceive entertainment and media in the area. We visualized the survey results in an interactive experience, allowing you to explore responses by country, question and topic. It’s springtime, which means corn is in season. 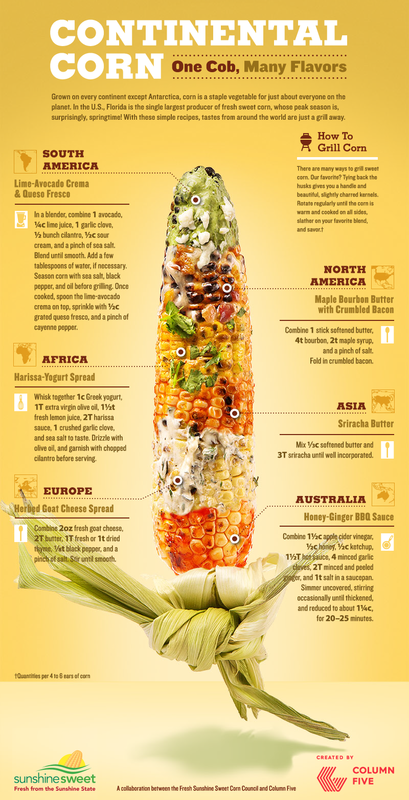 If you’re used to eating your corn with plain butter, this infographic will inspire you to live a little. We collaborated with PadillaCRT to produce this piece, featuring recipes from around the world. Let us know how we can help solve your communication challenges.